Stop what you’re doing! Topshop has a £42 dupe of Meghan Markle’s £1,450 Altuzarra dress | HELLO! April 18, 2018 - 19:32 BST Leanne Bayley Meghan Markle has stepped out in the most gorgeous dress - a striped Altuzarra ‘Audrey’ dress - which comes in at a pretty hefty £1,450. The belted pinstripe frock has statement buttons and an open slit at the skirt - gorgeous, but very very expensive. If you want a similar looking dress, but for a fraction of the price, Topshop has your back. The high street brand has a very similar dress on sale, but alas, all the sizes are nearly gone. HELLO! has reached out to find out if it’ll be coming back and we’ll be sure to let you know once we find out. It might be worth searching high and low in your local Topshop stores because, we think you’ll agree, it’s a pretty good dupe. Meghan Markle has stepped out in the most gorgeous dress - a striped Altuzarra 'Audrey' dress - which comes in at a pretty hefty £1,450. 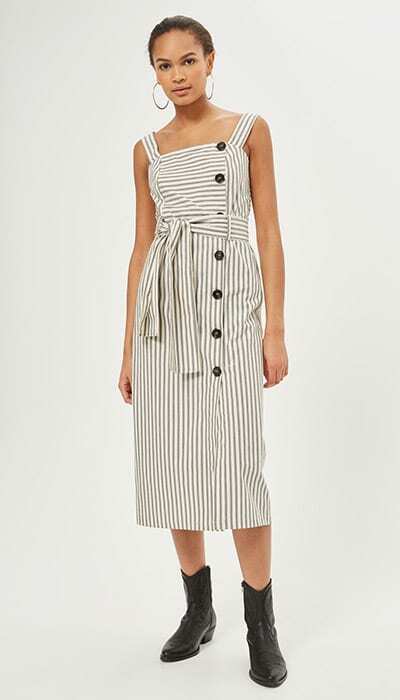 The belted pinstripe frock has statement buttons and an open slit at the skirt - gorgeous, but very very expensive. If you want a similar looking dress, but for a fraction of the price, Topshop has your back. The high street brand has a very similar dress on sale, but alas, all the sizes are nearly gone. HELLO! has reached out to find out if it’ll be coming back and we’ll be sure to let you know once we find out. It might be worth searching high and low in your local Topshop stores because, we think you’ll agree, it’s a pretty good dupe. The bride-to-be joined her future husband to attend the Commonwealth Youth Forum in London. It wouldn’t have been the easiest outfit to choose - what with the UK finally getting warmer temperatures. Meghan teamed her dress with a fitted black blazer which she wore over her shoulders. MORE: Is this the cheapest bag Meghan Markle has EVER worn? She completed the look with a navy and white cross-body bag by Oroton, a relatively unknown Australian brand. The trendy accessory is retailing at a very reasonable £171 - and what’s more you can even get a different colour-way which is on sale, and less than £100. Meghan’s ensemble was all finished with the help of delicate jewellery, and a pair of stilettos by the co-founder of Jimmy Choo, Tamara Mellon.